Father Tattoos Designs And Ideas To Dedicated your Dad To Make Him Happy. 1. Father and son tattoo design with clock ideas on arm for men. 2. Father and child hand tattoo design with date ideas on leg for men. 3. Daddy tattoo design to honor the father, tattoo ideas on wrist with small heart. 4. Sanskrit Quotes tattoo ideas dedicated to Father through tattoo. 5. Father and Daughter watching the sunset tattoo ideas on arm for guys. 6. Music lover dedicated a tattoo to Dad with Heartbeat and beautiful quote for Dad. 7. Father and Daughter looking sunset tattoo design on arm ideas. 8. Mom and Dad with their child tattoo design with clock on arm. 9. A beautiful small tattoo with heart dedicated to dad on wrist ideas for boys and girls. 10. Father and Daughter having matching tattoos on forearm dedicated to each other . 11. Dedicated to Mom and father tattoos designs on inner forearm for son and daughter who want to have this tattoo for their parents. 12. A trustful and lovable son and father tattoos design on arm. 13. Son And Father tattoos design on shoulder for men. 14. Father and son having a walk into the street tattoo ideas for boys and girls. 15. Beautiful Father and child’s small hand tattoo design on thigh for boys. 16. Beautiful Mom and Dad Sanskrit quote tattoo design on shoulder for those who want to dedicate this tattoo to their Mother and Father. 17. Father and son Riding bikes tattoo design on rib cage and stomach for men. 18. Maa and Paa with heartbeat tattoo design on forearm ideas for son and daughter. 19. Mom and Dad are heartbeat tattoo design on forearm and wrist ideas for boys and girls. 20. Father and son watching sunset tattoo design on rib cage ideas for guys. 21. Father and son matching tattoo designs ideas on wrist. 22. Father and daughter with compass tattoo design ideas for girls, who want to dedicate this tattoo to her Dad. 23. Beautiful child and father tattoos design ideas for men. 24. Daughter dedicated a beautiful quote and tattoo to her father on shoulder. 25. Son and daughter can dedicate this beautiful quote and Daddy infinity love with heart tattoo design on wrist. 26. Maa and Paa with heart and wave tattoo design on wrist ideas for son and daughter. 27. Son And Father tattoos design on arm. 28. 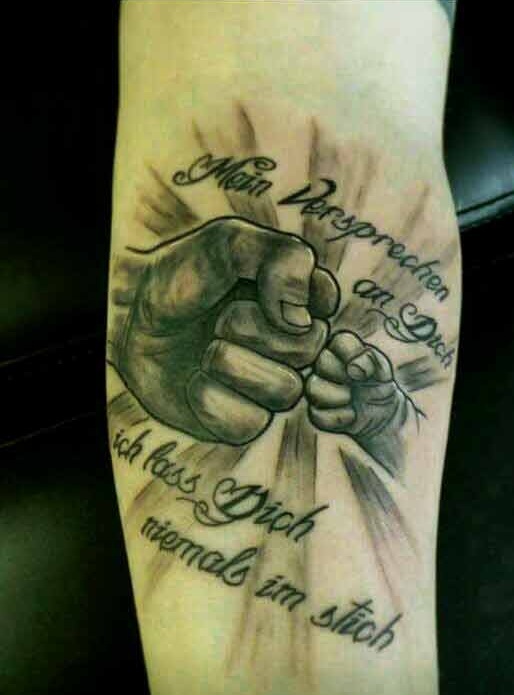 Father and child hand quote tattoo design on inner forearm ideas son and daughter. 29. Beautiful son and father tattoos design dedicated to father on shoulder. 30. Daddy dedicated tattoo design on wrist ideas for boys and girls. 31. Son and daughter may dedicate this beautiful hand tattoo design to their father. 32. Emotional Mother, Father, son and daughter tattoo design on forearm. 33. Tribute tattoo design to a father from her daughter. 34. Father and daughter tattoo design on rib cage for girls. 35. Father and daughter tattoo design on rib cage ideas for girls. 36. Tribute to dad tattoo from daughter tattoo design on shoulder blade. 37. Father and daughter tattoo design with big clock ideas on leg. 38. Father and son having fun on walk, beautiful tattoo design ideas on inner bicep for boys. 39. Father and son heart tattoo design ideas for boys. 40. Father, mother, Daughter and son tattoo design ideas on arm. 41. Father and daughter with heart tattoo design on inner forearm ideas for girls. 42. Father and child hand tattoo design on arm ideas for men. 43. Father and daughter tattoo ideas for inner forearm. 44. Beautiful Daughter and father tattoos design on wrist. 45. Infinity and heart tattoo Dedicated to dad on foot. 46. Father, mother and daughter tattoo design on inner forearm ideas for boys and girls. 47. Beautiful quote tattoo design dedicated to Dad idea on inner forearm. 49. Beautiful quote tattoo dedicated to father design on collar bone ideas for all daughters. 50. Family dedicated tattoo design on forearm ideas for boys and girls.